Walking along Wreck Beach. Photo: Great Ocean Walk. The Great ocean Walks is well mapped out and sign posted. As part of the Life's An Adventure tour, the group had access to Cape Otway Lighthouse. The start of the Great Ocean Walk. The group's first sighting of the Twelve Apostles. The wreck of the 'Fiji' on Wreck Beach. Photo: Great Ocean Walk. A timely reminder of the origins of the Great Ocean Road. Our private chef made our group of hungry hikers a delicious meal every evening. Thank you Cidy & Jordan @ the Arkina Lodge for your hospitality! The view from the top of Cape Otway Lighthouse. The Great Ocean Road from the air. Our Life's An Adventure guides on the three-day Great Ocean Walk hike. This view requires no introduction. No trip to the Great Ocean Road is complete without seeing the sights from a helicopter! What's left of the 'Fiji' on Wreck Beach. Photo: Great Ocean Walk. Great Walks has just returned from experiencing the Great Ocean Walk with our good friends at Life's An Adventure. The Great Ocean Walk is one of Australia’s most popular Bucket List walks. Whilst the famous Great Ocean Road doesn’t always follow the coastline, this walk allows you to go where the road doesn’t. To walk the entire Great Ocean Walk from Apollo Bay to the impressive Twelve Apostles is a staggering 104km, taking around 6-8 days. Life's An Adventure's Great Ocean Road walking holiday has been created so you experience walking the best sections in just three days, allowing you to discover its exceptional natural beauty over a long weekend. Over the three days we experienced a diversity of landscapes from majestic tall forests and coastal heathlands to a dramatic coastline like no other, with the sandstone sea stacks of the Twelve Apostles - its impressive finale. Along the way we saw plenty of wildlife including koalas, echidna and wallabies, as well as an array of birdlife. Our base for the trip was the superb Alkina Lodge. Designed by renowned architects, Glenn Murcutt and Wendy Lewin, the lodges were designed to ‘touch this earth ‘lightly’ and maintain a minimal carbon footprint. The lodges are fitted with a number of luxurious features, including north facing windows to allow light to pour in and a bespoke wood fireplace. As for food. Well, we were in for a treat as our personal chef, Canadian Cindy Leveillee-Goulet, created amazing meals every day. 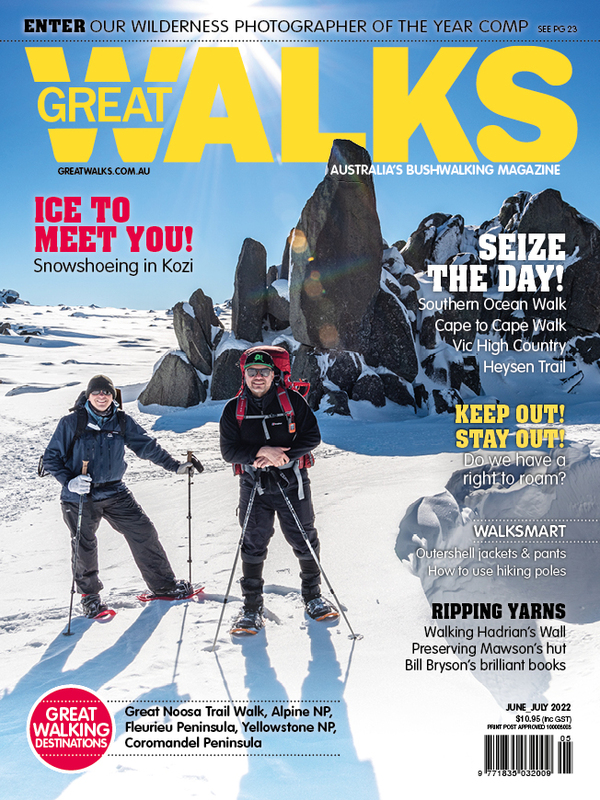 For the full story of our Great Ocean Walk experience check out the Feb-Mar issue in early 2018 and for more info on Life's An Adventure click here. Photos_Bobby Butler and the Great Ocean Walk.